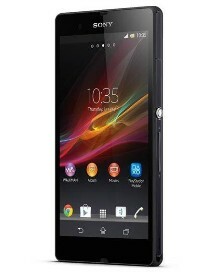 Sony Xperia Z comes with 5 inch full HD 1090p Display, built on the latest Android Jelly Bean and powered by Snapdragon S4 Pro quad-core processor. The phones has a 13 Megapixel Camera in the rear side of the phone that has the capability of shooting HDR videos with the Exmor RS sensor. As per Sony, Xperia Z has Battery Stamina Mode to provide its users with incredible standby time that is almost four times more than the others. The Xperia Z features a 2330 mAh Lithium-ion battery. The Stamina Mode of the phone shuts down the battery draining apps when the screen is off and starts it up again when the screen is turned on. Xperia Z features an IPX5/7 (Water-resistant) & IP5X (Dust-proof) certification, glossy look and feel with glass on both the front and the back side.